Don’t you just hate when you have to fly with a company, let’s call them Bryanair, who want £50 more just for you to take a 15kg with you on your holiday??? As I don’t really let myself be ripped off by Bryanair, I had to pack super-light for my 5 days in France/Italy. URGH! I am no good at packing light, not anymore. I used to fly a lot, but only over short weekends where it didn’t really matter and only back home and luckily my mum has the same size as me. So no need to pack at all really. But of course on my first proper holiday, I kinda wanted to take everything with me, but couldn’t. 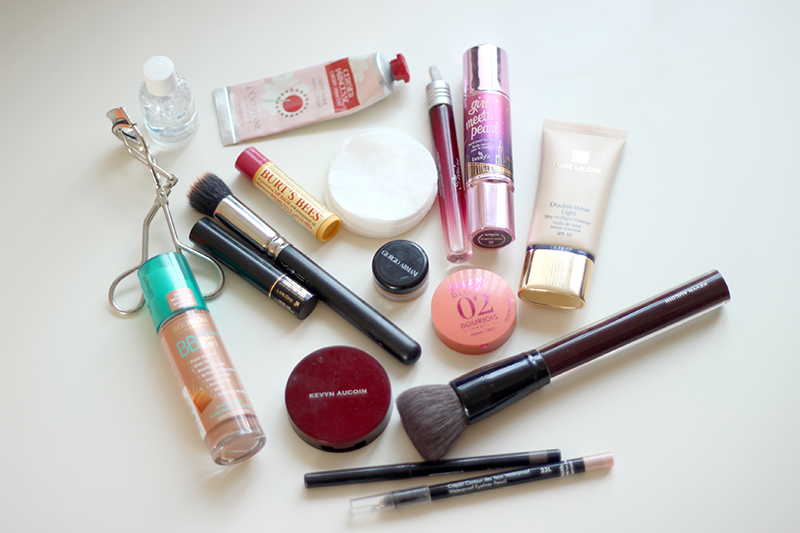 So here are my makeup essentials…. Estee Lauder Double Wear Foundation (Light) — Do I need to say much to this? I love the EL DW Foundation, but it’s just a bit too heavy for this warm weather! Bourjois BB Bronzing Cream * — I was really skeptical at first about this, I’m not a big fan of BB creams but this baby is great as a bronzer on the forehead and down the cheeks! Benefit Girl Meets Pearl Highlighter — HOLY GRAIL of highlighters at the moment. Many swear by the Sunbeam one but naaaaaah! Avon Glimmerstick Brow Definer (Blond) * — Sort of over-plucked my brows and while this is meant to be ideal for lighter hair colours, I love this one! Don’t like darker brows for some reason. Make Up For Ever Aqua Eyes Pencil (33L) — I quite like light liners on the lower waterline, sort of opens the eye and makes it look a lot bigger! Etat Pur Micellaire Makeup Remover * — I’ve not tried the Bioderma cleanser, but this baby is amazing! I can finally understand why everyone loves these types of makeup removers / cleansers: NO OILY RESIDUE! L’Occitane Cerisier Princesse Handcream — I reviewed the handcream here. Absolutely love it. Kevyn Aucoin Buffing Brush — HOLY GRAIL of foundation brush. Sooooo soft!!! Koji Eyelash Curler — I don’t normally use lash curlers, but why the heck not, right? Apparently a good dupe for the Shu Uemura one! L’Occitane Pivoine Flora Roll-On Perfume * — this peony scent is absolutely gorgeous. I’ve given the proper perfume to my mum, but kept this one and it’s just gorgeous! So yeah, what would you take with you on your holidays? What are your makeup travel essentials? I love the finish of it, isn’t it gorgeous? What’s wrong with the packaging though? I think it’s quite clever, you never really end up dispensing too much. Love to hear your thoughts! When I have recently been to Ibiza, I also traveled with ‘bryanair’… so I was in the same situation! I took with myself my liquid eyeliner, foundation, tiny hydrating lotion, one lipstick , one blush, mascara…and I think that was all! So yeah.. not much.. If you wish for to take much from this post next you must petition such strategies apt your won webpage.